I guess to most people it would not even occur that in regards to baptism there is a truth and that there is a lie. Most people go through life just skimming the surface of understanding, unless there is some apparent benefit to being informed. When people talk about current events, you usually can see that they haven’t given the subject matter much thought, very often they are just repeating something they read, saw or heard. More often than not this programing comes from a source that these people have come to trust. This source is engaged in the business of forming public opinion. This subject is enormously complex, but for my purpose it is sufficient to point out that the logic or the verifiability of what is said is not the main reason people are swayed, but rather by the prestige, clout and authority of the source. Unfortunately, godly wisdom tells us that the bigger, the more prestigious the worldly source the more corrupt it is. This is because of our sinful nature. As individuals our spirit can be victorious over our flesh, but collectively as we become powerful mankind always ends up arrogant, prideful, high minded and eventually abusive, therefore I contend that from a Christian perspective we should be more suspicious of the high and mighty worldly sources than the voice crying in the wilderness. In this world people that think are a minority and unfortunately many of them may not have your best interests at heart. So let’s cut to the chase. I will not be quoting scripture because you need to read the Bible in its entirety for yourself otherwise you cannot hope to understand much of anything. If you have not read it, I suggest reading a half hour of New Testament and a half hour of Old Testament every day. I do it in the morning when it is quiet and my brain is fresh to absorb God’s instruction manual. It will start like a chore, become a habit and end up a desire if you have a love for God. Once you have understanding in some area of the scriptures, the question arises, are you willing to obey? We are told in the Bible to repent, accept Jesus as our savior and to go be baptized for the remission of sins and for the gift of the Holy Spirit. One of the first questions is; does your salvation hinge on your baptism. Well to tell you the truth, I don’t know, but I don’t think so. I am confident, however that not being baptized as a comprehending Christian who has accepted Jesus as their Savior and who is repentant of his or her sinful nature will create a barrier between themselves and God. It will also limit the rewards that they will receive in the hereafter. I want my fellow Christians to be as close as possible to the almighty, because that is what the Bible says that God wants. You see there can be no greater reward imaginable than to be as close to the Father as possible. Jesus said, “no one comes to the Father except by me”. Jesus Christ is the bull’s eye and the bull’s eye is now an opening because of the price paid with perfect currency (His precious blood) that only Jesus had and he was willing to pay the price. Now when an arrow hits the center and only the center of this target, which is Jesus, then the arrow goes through the target to reach everlasting life and we approach God to the degree that our judgment day will allow. One of the things that we will be judged about is our obedience to God’s commands. 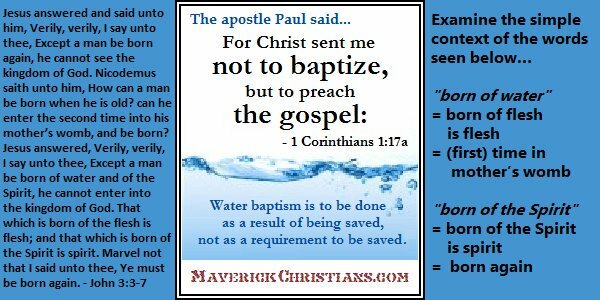 In order to understand this dilemma about baptism, one has to wrap their mind around a Biblical truth that most Christians think they know, but they really don’t. That is that Satan has dominion in this world. We Christians are behind enemy lines. This evil entity has followers like Jesus . This evil is very successful in getting dumb sheep to believe a lot of things which are not true. For example that God loves everybody. Sounds nice, but it is a lie and is nowhere to found in the Bible. In the Old Testament Jehovah said Jacob I love, but Esau I hate. Well if you were alive at the time of Esau would you love him with a Christian love, even though God said I hate him. Well if my God hates someone then I hate them also, because my God knows best. Esau became Edom and the seed of Edom is still very much with us today. These conscious and unconscious followers of the dark side, to borrow a Star Wars term, are referred to in the Bible as snakes, vipers and creatures. They are masters of deception and use all the weaknesses of our sinful natures against us. Unless you feel this and understand this, you are unteachable. When you realize who you are in relation to God almighty you will fear him. You will fear disobeying your creator. You will realize that he controls every beat of your heart. You will also realize that he loves you and everything including Satan was created by him for the ultimate purpose of his children passing the test of righteousness with their own free will. Baptism is a symbolic act which represents our dying to our old selves and going down like Jesus in his death for us and then coming up again out of the water a new creation in Jesus. Baptism is an act of obedience. Many Christians say you don’t have to be baptized, all you have to do is accept Jesus as your savior and you are good. Well, if you accept him, what are you accepting? Are you accepting the Lord of Lords, the King of Kings. Are you accepting Him, but not what he said. If you are playing these kinds of games, you are either a deceiver or a fool. In either case you will suffer because it is not just the deceiver that is punished, but the deceived also. You have a responsibility to not allow yourself to be deceived. How does one do that? Well, again, start reading the Bible, secondly start communicating with God. It is called prayer, I do it on my knees because you can never go wrong humbling yourself in the presence of the Lord. Pray to God in the name of Jesus to help you and keep you from being deceived. You can and should also pray for wisdom and understanding. If you talk too much, you can ask God to help control your tongue. You can pray for the Holy Spirit, but I believe God gives power to those that are ready and willing to do his work. Lastly, but should be first, thank him for all your blessings, as long as you are breathing there is always something to be thankful for. As your relationship with Jesus and therefore with God grows, you will begin to understand his love for you and your love for him will grow. You will want to please him and you will feel shame if in your soul you know you are not in line with his righteousness ( which is a Biblical synonym for Godly love and order ). Now why in the world would you refuse to obey a direct command from your Lord and Savior? The answer is because you are being deceived. Sometimes it is an individual that is deceived sometimes it is a group, an institution or even a country. Can you explain why then there are some good intentioned people that actually believe that sprinkling water on an infant ( who has no idea what is going on) is accepted and considered a baptism? This Catholic or Orthodox ceremony is harmful to the extent that it deceived the parents and later the child into believing that he or she was baptized and therefore robbing that soul of the opportunity to obey their Lord and master and thereby receive the blessings that come with obedience. I see nothing wrong with a ceremony that dedicates a child, by the parent’s well wishes, to a Christian life, but this should NOT be called a baptism. Only a person can decide for themselves whether they are ready and willing to obey the Lord. I don’t understand the psychology of all the characters that are involved in this deception. Some of them may be deceivers ,however I suspect most are deceived. From the stand point of the religious leaders in these institutions, you have the authority of the church. This is an awesome institution and there is a lot of pride in association to the institution. This is partly because of the size and beauty of the buildings and the wealth and power of the organization. This is peer group pressure on steroids. The parishioners are affected for many of the same reasons. Most people do not read the Bible and therefore it doesn’t even enter their minds to challenge the church’s authority. There used to be a fairy tale that quietly disappeared because Satan’s world does not want the dumb sheep to wake up. It was about an Emperor that was deceived by a snake tailor into taking the position that his suit was the most beautiful suit possible, but only intelligent people could see it. The King did not want to admit that he could not see the suit, so he paraded around naked and all his subjects also kept silent. They must have been afraid of the King and they also did not want to admit that they were not intelligent enough to see the suit. This charade continued until a young boy jumped out of the crowd and screamed, “Look! The emperor has no clothes!” Maybe that is why it is said that the truth can come out of the mouth of babes. Well that is it, you can take the blue pill and go back to sleep or take the red pill and see how deep God’s Biblical truth is. and Denominationalism erroneously expressed through water baptism.